I believe in humanity. I believe in our potential. I believe our best days lie ahead! A character in George Bernard Shaw's play Back to Methuselah stated, "Some people see things as they are and say why? I dream things that never were and say why not?" 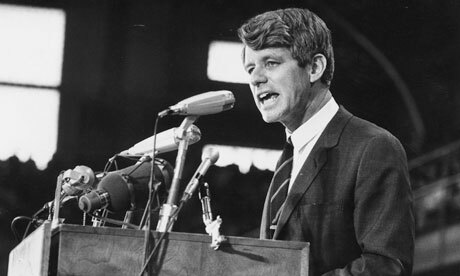 Robert F. Kennedy used a paraphrased version of the quote in his speeches. Kennedy said, "There are those that look at things the way they are, and ask why? I dream of things that never were, and ask why not?" Why not is a very important question. It's the question we should always ask ourselves when we believe something isn't possible for us for our world. The world has hundreds of negative premises on which it operates. They should and must be challenged by a good why not. We cannot have leaders who truly listen and respond to the will of the people who entrust them with their power. Governments have always been that way. We cannot expect them to change. Why not? We cannot be responsible stewards of the environment without massive government taxation and regulation to tell us how. Why not? We cannot coexist and build communities with people we disagree with religiously, politically, or economically on this planet. Why not? We cannot feed the people of this planet without worrying about who gets paid for it. Why not? We cannot do everything possible to see that every human being has an opportunity to pursue his or her talents to their full extent. Why not? We cannot have a successful economy that doesn't involve war and conquest for ideology and resources. Humans have always done this. We can't change it. Why not? A company must always have a bigger share of its market pie. It cannot be satisfied with merely employing thousands of people, keeping its customers happy, and making a healthy profit. Why not? We cannot have a debt-free money supply and a banking system that doesn't practice usury. Why not? Each and every one of these negative premises is to some extent damaging people in our world. They make it harder for people to live their lives and get the most possible out them. We need to be asking a BIG why not on these issues and many others. Someone owes us an explanation as to why the positive opposites of these premises are not the path we need to be following. Some can be reversed through our own personal actions. Others will require the disentrenchment of the powerful interests that keep these premises afloat. Let's pull this back to the personal level. You have negative premises too. Negative premises that are holding you back from your goals. Fortunately, the only entrenched interest you have to overcome to address them is you. I know, not always as easy as it sounds. You don't have to go to all the trouble of listing your negative premises. You probably could not come up with all of them anyway. Simply become aware of them when they appear. They are going to sound like the following. I can't pass the math test. I can't go to college. I can't get a better paying job. I can't be the top salesperson. I can't be the best baseball player. I can't be world-class musician. I can't be a good mother, father, grandmother, or grandfather. Every time you hear an "I can't" come into your mind, you are establishing a negative premise. Whenever you recognize your mind formulating a negative premise stop and challenge yourself. Demand to know why you cannot do whatever it is you want to do. When you begin to put this into practice you will see that dreaming things that never were and asking why not is a powerful tool for success.